Ο Κύπριος υπουργός δήλωσε ότι η Κύπρος έχει συμβόλαια και προγράμματα με διάφορες εταιρείες που κάνουν τις μελέτες και παίρνουν σεισμογραφικά δεδομένα. Dr. Robert Ballard’s deep-sea explorations come alive through September 1, 2012, at Mystic Aquarium's Nautilus Live Theater. This 50-seat, state-of-the-art theater space transports visitors to the unknown depths of the world’s oceans. Join Dr. Ballard and the Corps of Exploration aboard the Exploration Vessel (E/V) Nautilus as they explore Earth’s last great uncharted territory. When the E/V Nautilus is at sea, telepresence technology brings live video and two-way ship-to-shore communications to the Nautilus Live Theater. 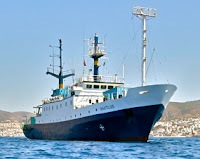 You’ll have a front-row seat as the Corps of Exploration searches for undiscovered natural wonders and lost chapters of human history in the deep-water regions of the Black, Aegean and Mediterranean Seas off the coast of Turkey and Cyprus.